Miguel Zenón performs with the 67-member Symphonic Jazz Orchestra. On Saturday, Sept. 30th, we presented our 6th free concert for the community in partnership with Carpenter Performing Arts Center’s Arts for Life program. SFJAZZ Collective alto saxophonist and MacArthur Foundation fellow Miguel Zenón joined the 67-member Symphonic Jazz Orchestra for a concert featuring four premieres. 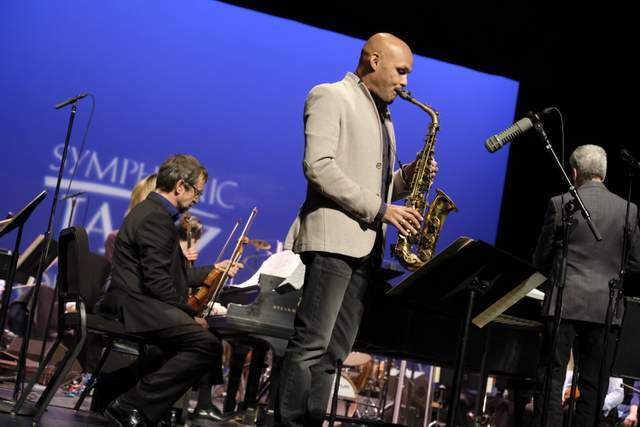 Soloist Miguel Zenón made his first orchestral appearance, performing new arrangements of two of his works, “La Maga” and “El Club de la Serpiente.” The highly complex charts and outstanding performance by the 67-member Symphonic Jazz Orchestra thrilled the audience, leading to an encore by Mr. Zenón. Free symphonic jazz concerts are just one way that we engage the community in the transformative power of music, along with providing in-classroom music education to schools throughout the Los Angeles area. A special thanks to the Carpenter Performing Arts Center, National Endowment for the Arts, Music Performance Trust Fund, Herb Alpert Foundation, Ella Fitzgerald Charitable Foundation, Arts Council for Long Beach, Fender, Trader Joe’s and our generous donors for making this concert possible.